Death by Modern Medicine is a blockbuster book that will bust the blockbuster drugs that have become the hallmark of modern medicine. It contains an unprecedented three forewords by Dr. Abram Hoffer, the father of orthomolecular medicine, Dr. Joseph Mercola, well known for his top-rated website mercola.com, and Dr. Julian Whitaker author of the famous health newsletter Health and Healing. This book identifies the tragic aspects of a medical system that in its short history of about eighty years, has managed to kill tens of millions of victims. 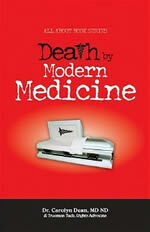 “Death by Modern Medicine” goes beyond the statistics of deaths due to drugs. It shows how the medical monopoly that created the system in the first place is allowed to control health care. A tale of propaganda, health care bureaucracy, the business of cancer, our own personal addictions to sugar and drugs, and the denial we all harbor to help us cope with the overwhelming burden are woven into this 360-page book. Since then people's eyes have been opened to the full horror of modern medicine. There have been 140,000 fatal or near fatal reactions to Vioxx; one third of the millions of women who took fen-phen, the weight loss drug, suffered heart and lung damage; heart disease is caused by Celebrex and all the other non-steroidal anti-inflammatory drugs; Prozac is causing suicides and homicides as well as heart disease; and the list goes on.